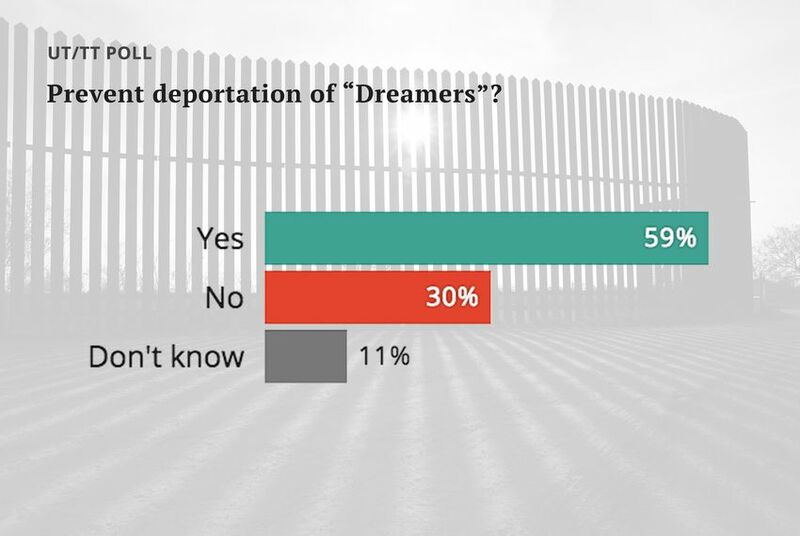 In the face of a running political argument over what to do with “Dreamers” — recipients of a program aimed at giving some young undocumented immigrants relief from deportation — most Texas voters oppose deportation, according to the latest University of Texas/Texas Tribune Poll. Three-fifths of the registered voters surveyed said they would continue the Deferred Action for Childhood Arrivals, or DACA, program, while 30 percent said the program should end. Democrats strongly favor continuation (86 percent), while only 39 percent of Republicans would do so. And there is a decided split between self-identified Tea Party Republicans and non-Tea Party Republicans: 69 percent of the first group would end the program, while 41 percent of the non-Tea Party faction would end it. Among non-Tea Party Republicans, 48 percent said they would continue DACA. More than one in five Hispanics said they would end the DACA program, while 64 percent said they’d keep it. “There is some nuance in Texas attitudes on this,” said Jim Henson, co-director of the poll and head of the Texas Politics Project at the University of Texas at Austin. A thin majority of Texans disagree that “Undocumented immigrants currently living in the United States should be deported immediately.” Once again, there is a partisan split: 19 percent of Democrats agreed with deportation, while 64 percent of Republicans agreed. Fifty percent of white voters agree, along with 37 percent of black voters and 36 percent of Hispanic voters. “Hispanics in Texas aren’t overwhelmingly liberal,” said Josh Blank, manager of polling research at the Texas Politics Project at UT-Austin, noting Hispanic voter responses on deportation and several other immigration issues. Most Texans believe local law enforcement should cooperate with federal immigration authorities, including 67 percent of white voters, 45 percent of black voters and 44 percent of Hispanic voters. There is a gender gap in the responses and also a partisan gap. Men were 10 percentage points more likely to support federal/local cooperation than women, and Republicans were 65 percentage points more likely than Democrats to take that position. Voters were split when asked whether law enforcement agencies should decide policies for their officers, or whether officers should always be allowed to ask people they stop about immigration status. Overall, 44 percent supported the “show me your papers” position, including 69 percent of Republicans and 15 percent of Democrats. Like the people who represent them in Washington, Texans are split when it comes to health care — and they’re split along party lines. The poll presented two positions to consider: “the current health insurance system in the United States, in which most people get their health insurance from private employers, but some people have no insurance;” or “a universal health insurance program, in which everyone is covered under a program like Medicare that's run by the government and financed by taxpayers.” The current system found favor from 13 percent of Democrats and 63 percent of Republicans; a universal system was favored by 74 percent of Democrats and 21 percent of Republicans. Half of the respondents said they would like to repeal the Affordable Care Act — also known as Obamacare — a group that includes 84 percent of Republicans. Most of the repealers — 57 percent — would like to replace the ACA with an alternative, while 38 percent would repeal it and not replace it. Of the 38 percent who would keep the federal health care law, only 14 percent would leave it as is; 74 percent said they would prefer to expand what the law does. "Democrats are relatively unified, moving in the direction of a single-payer system, but there is much less sense of where to go among Republicans once you get rid of Obamacare,” Henson said. He said the numbers reveal some differences within the Republican ranks. For instance, only 22 percent of non-Tea Party Republican voters who want repeal said they would not replace the federal health care law. Among Tea Party Republicans, 62 percent said the law shouldn’t be replaced after repeal. That’s a change from the June UT/TT Poll, when 54 percent of Tea Party Republicans who said they wanted to repeal the law also said they wanted to replace it. The University of Texas/Texas Tribune internet survey of 1,200 registered voters was conducted from Oct. 6 to Oct. 15 and has an overall margin of error of +/- 2.83 percentage points. Numbers in charts might not add up to 100 percent because of rounding. This is one of several stories on the latest University of Texas/Texas Tribune Poll. Also today: Texas voters on Confederate memorials, guns and other issues. Earlier: Texans grade President Trump, his qualities and his response to top issues; voters rate the top figures and institutions in state politics; and impressions from Hurricane Harvey. Coming Tuesday: The mood and political climate of the state.